This blog has been going for three years with this being the 301st post. Within the last year, things have slowed down considerably for a number of different factors. Perhaps the biggest reason is being too busy with the current project (XenClient). However, there are several other factors as well. Blogging turns out to be a mostly solitary venture. It takes a great deal of commitment and time to formulate a blog that gathers widespread adoption. Even then, I suspect that success breeds pressure to always push harder. It is difficult to gain that kind of momentum and keep it there. This kind of stress is similar to anyone trying to hold on to success and fame. Very few go the distance. Perhaps very few should. Originally I had big plans for doing this. It seemed like a great idea for bringing in new customer requirements. It also seemed like a good place to try out some ideas of my own. Quietly, I hoped for a large following. I tracked the visits per day and experimented with different blog postings to see what would make a difference. This theory was flawed. Any particular post might do better than others but overall it really did not make a big difference. At one point the goal was to have about a hundred visits a day. There was a blog post almost every day. This artificially seemed to push up the numbers based on the number of posts but never seemed to bring any kind of long term growth. It was probably similar to typical sales cycles. The sales guy can always make things look better based on activity at the end of the month but the same person will never guarantee long term great results. Later on, it just seemed a bit pointless. The things I had set out to do just did not happen. 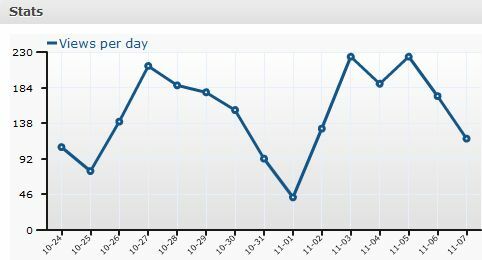 Also, ironically, my visit rate jumped up consistently with complete blog neglect. It seems a bit like tracking the stock market. The sooner it is realized that logic has nothing to do with it, the better. Which brings us back to passion and purpose. Success is truly an internal event. It is the belief that one has a passion for doing something that really brings about the best results. In fact, it is also the belief in letting go and being able to admit to mistakes which clears the way to a better future. My passion is mostly about making things better. I enjoy learning how things work (in true engineering fashion) and proceeding to think of ways of making it work even better. Everything can be improved. That alone is a major passion of the entire business world. Some people focus on how much they can get. Others do it for the thrill of making a difference. So, what the heck does all this mean? Well, either it means nothing or it means that I might have finally found new purpose to doing this blog. I suspect it is the latter. Time will tell. It is perhaps when I am most concerned about what people think that I am the most evasive. To clear the air and breath fresh, is actually quite good. Shadows of the mind dance more harsh than the path of the real daylight. In other words, the thoughts overshadow action. In fact, thoughts can easily confuse what path to choose. With that in mind, it is time to start over. The blog needs renewing and obviously refocus as well. It felt good just to write the post. I was starting to lose interest and now it seems like a new blog again. I always enjoyed reading your blog. Thanks for sharing your thoughts and experience. Thanks Ray. I appreciate it.